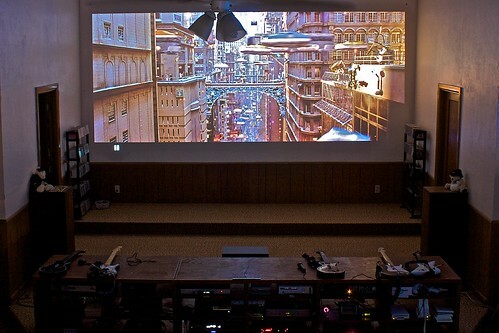 Home Theater: Thinking Big. Really Big! You’re looking at a 17 foot (205 inch) diagonal, 1080p projection system with well over a thousand watts RMS distributed across 7.1 channels. It presently features a Mac (as media librarian), DirecTV / HD-DVR, 16-channel IR/color 1 TB security DVR, SVHS, DVD, MD, CD, Sirius sat. radio, XM sat. radio, broadcast HD receiver, blueray / PS3, HD-DVD / XBox360, PS2, XBox, Gamecube, and a Wii. The receiver is a Sony STR-DA5300ES with six HDMI inputs, and the projector is an Optoma HD-80. Deb and I built and finished the audio cabinetry, and I put the electronics together. Seating is a 12-foot wide, 8-person couch with two built-in recliners at the center “sweet spot” just out of the picture, a few feet in front of the cabinetry.